Over the years I have been fortunate to travel extensively, but my recent extended visit to Morocco was the longest time I have spent on a different continent and in a different culture. With me went an iPod loaded with an eclectic mix of classical, world, jazz and folk music, plus high quality headphones and a pair of the wonderfully portable XMI X-mini II speakers. Now here is the interesting point - as my trip progressed and as I became more atuned to both the physical and cultural landscape of North Africa, I found myself listening to less and less western classical music, and to more and more from other genres. There were exceptions, most notably Bach who transcended landscape. But I was surprised at the change in my listening pattern, and it was a change that had not occured on dozens of shorter trips with mobile music players. It seems classical music's ability to make the essential connection with inner life is surprisingly sensitive to external circumstances. Which, presumably, is why applause between movements and tweeting during concerts are such contentious subjects. Clearly my experience was a statistically insignificant sample of one. But I am becoming increasingly convinced that the solution to classical music's current problems lies not with the fashionable mantra of increased accessibility, but rather in the fuzzy area that lies between science and pseudoscience. An earlier post touched on Bell's theorem, which asserts that one subatomic 'object' can instantly affect another particle of the same sort no matter how physically distant the two particles are from each other. This could mean that in classical music the composer, performer, audience, instruments, hall acoustic, physical performance space, climactic and environmental conditions, in fact every aspect of physical and cultural landscape, are connected more deeply and subtly than is currently thought. Following this path takes us from rural Morocco to the more immediate subject of new technology. There is clear evidence that classical music struggles to work at more than one remove. It is written for live performance in a concert hall and that is where it works its magic best. The music survives the first remove of being heard from a recording replayed on high quality equipment in a familiar domestic environment. But as the removes increase, geographically, culturally and technically, the power of the music to engage decreases in inverse proportion to the number of removes. Which explains why a Mozart symphony heard through the multiple removes of a digitally compressed file and headphones on a different continent and in a different culture struggles to engage. Now here is the point of this post. New technology in the form of the internet, digital files and mobile computing, are all designed to allow access to content at many removes. But classical music struggles to survive through those removes, which means new technology may be part of the problem rather than solution. There is scientific as well as anecdotal evidence to support this view. Power outputs of mobile music devices are capped to conserve battery life. This means the audio power output of the headphone stage of an iPod is limted to around 0.2 watts and to achieve the all important loudness high efficiency earbuds are standard issue. But high efficiency transducers are the enemy of bass, transient attack and dynamic range, all essential components of classical music. So starting with the compressed MP3 file format, compromise is piled on compromise. And if slam is what matters in a Beethoven symphony you are more likely to hear it in the concert hall than through an MP3 player. To date classical music has actively courted new technology as a desirable and superior partner. But is it not time to rethink this position and start driving home the message that anything other than live music is actually a poor substitute? Marketing and social media could play a big part in the call to action in the concert hall. How about aggressive collegiate marketing campaigns for live music built around straplines such as 'Test drive a concert hall', 'Live classical music is louder than your iPod', 'Play an instrument not Facebook' and 'If classical music is not live it is dead'. And why not attention getting offers such as discounted concert tickets for anyone trading in iPod earbuds? This post is one of several brainstorming paths intended to challenge the preconceptions and hidden agendas that are currently bogging down classical music. Lawrence Durrell opined that landscape dictates behaviour and thought. Live performance in the concert hall has dictated the behaviour and thought process of classical music for centuries and, despite recent attempts to create digital substitutes, no viable alternative has emerged. So surely it is time to accept this preeminence and to stop apologising for the concert hall and really start promoting it? 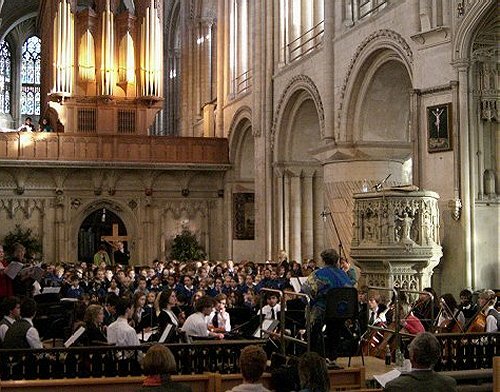 * My header photo was taken at the recent performance by Aldeburgh Young Musicians of Louis Andriessen's Workers Union and the footer at the Norwich Cathedral performance of June Boyce-Tillman's Revelations of Divine Love. Both were priceless examples of how if classical music is not live it is dead. If any readers are revelling in the live sounds of the Bach St John Passion at Snape on Good Friday I will see you there. 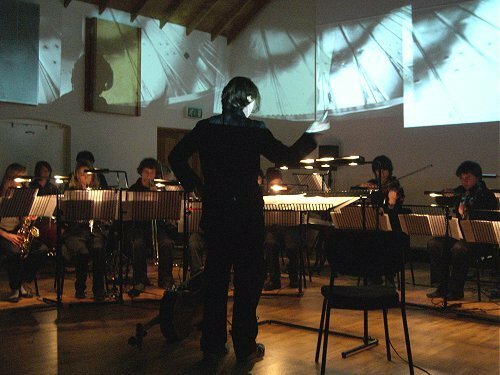 In classical music the composer, performer, audience, instruments, hall acoustic, physical performance space, climactic and environmental conditions, in fact every aspect of physical and cultural landscape, are connected more deeply and subtly than is currently thought. With all due respect, I VEHEMENTLY DISAGREE with all of that. At its best, classical music is a solitary and personal experience... It's between just you and the sound coming from the orchestra or quartet or opera house. The fact that there are many other people sitting in the same room with you (or any other environmental detail) doesn't add anything to the experience. An earlier post touched on Bell's theorem, which asserts that one subatomic 'object' can affect another such object without even the slightest interval of time or space separating them. I'm afraid you've got that "theorem" more than a little confused. Bell's experiments confirmed that, at the subatomic (i.e., quantum) scale and under certain circumstances, doing something to a subatomic particle at one location could *instantly* affect another subatomic particle of the same sort no matter how physically *distant* the two particles were one from the other. The phenomenon is called "quantum entanglement". TUP - "The fact that there are many other people sitting in the same room with you (or any other environmental detail) doesn't add anything to the experience" - if you ever have the chance to attend, for instance, a Promenade concert in the Albert Hall you may well change that view. And incidentally, please can we keep block capitals and bold type for funeral invitations? ACD - thanks for clarifying that point. In fact the clarification makes Bell's theorem more relevant to the post and I have amended the text accordingly. "If you ever have the chance to attend, for instance, a Promenade concert in the Albert Hall you may well change that view"
No, that will not alter my perspective or my feelings. Listening and studying the great masterpieces in the privacy of my home was (and continues to be) for me the most thrilling activity. As a native of northern New Jersey of course I enjoy going to Carnegie Hall and the Metropolitan Opera once every few months and donate what I can, but that never compared to being able to get to know so many masterpieces in such detail at home... I cannot begin to describe how many times solitary listening lifts me to the heights of aesthetic experience. Is live performance better? I think the most renowned orchestras tend to be so precise, well-rehearsed and consistent that they sound "inhuman" in live performance as well. Not that I'm complaining, I actually admire that. But I simply don't see why the communal experience should automatically be viewed as 'better'. There is just something very special about being alone with the music as far as I'm concerned. TUP - we are actually in agreement. My post is not about the benefits of the communal listening experience. It is about classical music being "surprisingly sensitive to external circumstances". You say that for you "there is just something very special about being alone with the music". I have no problem with that at all - it means you are sensitive to external circumstances and that solitary listening suits you best. So we are singing from the same hymn sheet. Even if it is not in the Albert Hall. "So we are singing from the same hymn sheet. Even if it is not in the Albert Hall"
"Mr. Gould believed that personal display was corrupting, deplored applause at concerts, and thought that the concert hall would disappear by the year 2000 because of progress in the technology of recording. He claimed that the listener to recordings at home, by adjusting controls to his or her personal taste, could come closer to an ideal performance and reach a depth of musical experience unattainable at a live concert"
Pli, thought the most interesting part of that was *why* you think Bach transcends landscape? And why do people from different cultures/landscapes appreciate classical music (or, slightly tangentially, popular music)? "But there is real pathos in this dying people. These are my people-my own father, brother, mother, aunt and uncle...Yet I have no illusions: the death of these archaic, unprofitable, businesses is inevitable..But it is also the case that something rich and timeless that bids us to our roots and past, something central to our cultural imagination..is being lost"
As a composer I'm keenly aware of the difference between a live performance and a recording - even the best recording doesn't carry half the value of the live performance. For me music is a social interaction; sure there are huge problems with the way it is presented in most concert halls, but I don't subscribe to Glenn Gould's view, I think if classical music reached the stage where it only existed within technology/recording it wouldn't last very long at all. ie I subscribe to your view that "if it's not live it's dead". I love the idea of landscape changing your taste, but I would suggest it's music in general, rather than specifically classical music that is "surprisingly sensitive to external circumstances". I don't think the fact that you stopped wanting to hear classical music during your travels signifies anything about the sensitivity of classical music itself, it merely reflects how you felt on the trip. Another person might just as likely go to Morocco and suddenly stop wanting to hear pop music and only want to hear classical music. It's music in general that is sensitive to our situation and mood, because it's so intimately connected with them. Your post and those linked that brought it to my attention make the case for the power of live performance and why it is so vital and necessary. It is incredibly frustrating to see the institutionalized b.s. that often passes for marketing or publicity efforts that have ghettoized the classical concert experience among certain demographics.